Lingobit Localizer is an ideal software localization tool for .NET Framework applications, aimed to make collaboration with external translators smooth and efficient. Currenty, Lingobit Localizer supports .NET 1.0, 1.1, 2.0, 3.0, 3.5 and 4.0 versions.From now on, no source-code is required and all technical details are hidden behind intuitive and easy to learn interface. State of the art automated tools for QA, translation reuse and project management guarantee high productivity and outstanding quality. Lingobit Localizer radically simplifies software translation, inspiring even small businesses and individuals to localize their applications. 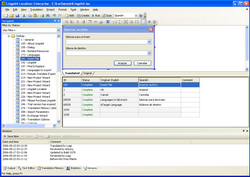 Lingobit extracts all localizable resources such as strings, menus and forms directly from assembly file (*.exe, *.dll) and presents them in productive translation environment with such features as translation reuse between versions, automatic validation for common translation errors, exchange wizard for easy collaboration between translator and manager. After you translate resources, Lingobit Localizer creates satellite assemblies and places them in directories with language code names (for example, en-gb is English – Great Britain). This is a default location for satellite assemblies used in Microsoft .NET Framework. It automatically locates resources in those directories and selects appropriate using language settings. Satellite assemblies is the default way to localize .NET applications. To make form localizable set form's Localizable property to true. You can do it using Properties Window in Visual Studio. All hardcoded strings could be extracted to assemblies using Lingobit Extractor. It performs about 95% of the work by extracting strings to resources and replacing them with resource loading code. Main assembly stores resources for neutral culture. If .NET can't find localized resources for current language in satellite assembly, it will load resource for neutral culture. You can read more details about fallback and resource structure at http://msdn.microsoft.com/en-us/library/sb6a8618.aspx. When you add main assembly into Lingobit Localizer project, localization tool will parse all resources from the file. Then Lingobit Localizer will look for satellite assembly for language that is set as Original in Lingobit project. After it software will created joined set of resources. It allows to localize applications with neutral resources that are moved to separate assembly. Such approach is recommended by MSDN for WPF localization http://msdn.microsoft.com/en-us/library/ms788718.aspx. Assembly signing (also called strong-name signing) gives an application or component a unique identity that other software can use to identify and refer explicitly to it. A strong name consists of its simple text name, version number, culture information (if provided), plus a public/private key pair. This information is stored in a key file. If your main assembly is signed you need to sign localized assemblies also. You can do it in Lingobit Locazer at Properties > .NET > Satellite Assebly Output. Both types of key files are supported .snk (without password) and .pfx (with password). An organization can have a closely guarded key pair that developers do not have access to on a daily basis. In that case you can use Delay Signing. You can read about it at http://msdn.microsoft.com/en-us/library/t07a3dye.aspx. Delay signing is activated by default if you are localizing signed assebmly and key file is not set. For testing of delay signed assembly you need to switch off key verifycation. You can do it using Strong Name Tool that is distributed with .NET. You can read more about at http://msdn.microsoft.com/en-us/library/k5b5tt23.aspx. If you didn't switch off verifycation, your delay signed satellite assemblies will not be loaded. .NET localization may require loading of referenced assemblies, because they could store a lot of important information, especially when you use 3rd party controls.